Published on November 19, 2009 in Case Study, Fun, Killer Kopywriting, Retail Strategies and Sales. 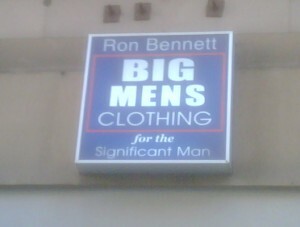 1 Comment Tags: Funny Retail Sign, Retail Case Study, Retail Humour, Retail Sign, Retail Signage, Ron Bennett. A good sense of humour never hurts, unless of course if you’re INsignificant! Exponential Marketing Strategies include the use of humour as long as it is tasteful, relevant and ADDS to the customer experience as this one plain does with a tongue-in-cheek approach. Think of ways you can re-phrase want you do using puns and other linguistic skills – we teach them at Unleash The Speaker Within as well as in our Killer Kopywriting and Konversation Workshops… Contact us if you want to take laughs and giggles and turn them into sales!